Selenium is the most widely-used open source test automation solution in the world today for automated web application testing. Running in most browsers and operating systems and controllable by popular programming languages and testing frameworks, the Selenium automation testing suite of tools is used by many organizations around the world to create robust web browser automation.Selenium provides a record/playback tool for authoring tests without the need to learn a test scripting language (Selenium IDE). It also provides a test domain-specific language (Selenese) to write tests in a number of popular programming languages, including C#, Groovy, Java, Perl, PHP, Python, Ruby and Scala. The tests can then run against most modern web browsers. Selenium deploys on Windows, Linux, and OS X platforms. It is open-source software, released under the Apache 2.0 license: web developers can download and use it without charge. OdiTek Solutions provides expert Selenium web application testing services, backed by a certified team of Selenium experts trusted by clients. OdiTek offers a wide range of Selenium automated testing services, such as Selenium automated functional testing, Selenium automated regression testing, Selenium browser compatibility testing, automation framework creation, integration with test management tools, etc. Wrapping Selenium testing scripts in the Testing Framework (JUnit, TestNG, etc.) of your choice. Customized reporting services using HTML. To optimize our selenium test suite for covering more test cases in less time we also perform grid testing by diving load into multiple machines at one time and let the execute test as indvidual machines and gris testing also make efficient in performing browser compatibility testing. Our test engineers can help you to identify when & what to automate, create robust reusable test cases, execute & enhance regression tests, and maintain automated tests alongside application changes. We can thus help you achieve optimum automation coverage of your application, accelerate time to market, reduce operational costs, and realize your quality vision. 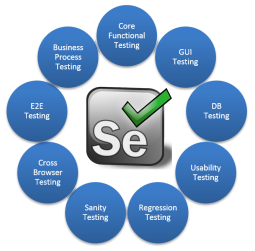 We can implement Selenium automated testing solutions for you to meet your timelines, budget and quality goals. Take advantage of our Limited-Period Risk-Free Trial Offer. Our team has working knowledge of design patterns and advanced Selenium Webdriver skills in a live project. crafted a large test suite to meet the business requirements. Ability to coach junior team members is preferred. Good understanding of behavior-driven testing tools like Concordion, JDave, JBehave, Easyb, Cucumber etc. Cross browser testing and aware of the challenges. Well-versed in managing automation jobs using Jenkins or Bamboo CI tools. Experience in setting up Continuous delivery for at least one live project. Able to manage automation agents on Amazon cloud infra also known as AWS. Ability to integrate automation results with any bug tracking tools like JIRA or TestRail. We have potential to debug the Selenium webdriver source code. And commands the ability to propose a solution or suggestion to the Core Selenium team. Selenium is an open-source and a portable automated software testing tool for testing web applications. It has capabilities to operate across different browsers and operating systems. Selenium is not just a single tool but a set of tools that helps testers to automate web-based applications more efficiently. Selenium is composed of multiple software tools. Each has a specific role. Selenium 2 is the future direction of the project and the newest addition to the Selenium toolkit. This brand new automation tool provides all sorts of awesome features, including a more cohesive and object oriented API as well as an answer to the limitations of the old implementation. Selenium 2.0 is the product of that effort. It supports the WebDriver API and underlying technology, along with the Selenium 1 technology underneath the WebDriver API for maximum flexibility in porting your tests. In addition, Selenium 2 still runs Selenium 1’s Selenium RC interface for backwards compatibility. Selenium RC was the main Selenium project for a long time, before the WebDriver/Selenium merge brought up Selenium 2, the newest and more powerful tool. Selenium IDE (Integrated Development Environment) is a prototyping tool for building test scripts. It is a Firefox plugin and provides an easy-to-use interface for developing automated tests. Selenium IDE has a recording feature, which records user actions as they are performed and then exports them as a reusable script in one of many programming languages that can be later executed. Selenium-Grid allows the Selenium RC solution to scale for large test suites and for test suites that must be run in multiple environments. Selenium Grid allows you to run your tests in parallel, that is, different tests can be run at the same time on different remote machines. This has two advantages. First, if you have a large test suite, or a slow-running test suite, you can boost its performance substantially by using Selenium Grid to divide your test suite to run different tests at the same time using those different machines. Also, if you must run your test suite on multiple environments you can have different remote machines supporting and running your tests in them at the same time. In each case Selenium Grid greatly improves the time it takes to run your suite by making use of parallel processing.